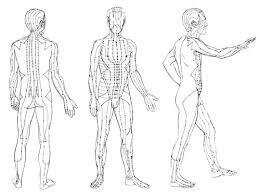 Demystifying Acupuncture: What Are Channels? In fifth grade science class, we were all put in groups and assigned one of the systems of the body to research and report. My group was assigned the digestive system, which we drew into an outline of one of our classmates on a long strip of brown paper. I listened to all the presentations and envisioned the systems of the body all fitting together like independent puzzle pieces, each occupying their own space and fitting cleanly together. If only the body were that simple! Like a car, where problems are solved by replacing parts; cars don’t get scar tissue. The body is made up of organs and structures, but it’s also more than just the sum of its parts. A healthy body not only consists of healthy parts, but of healthy relationships between them. These relationships are maintained by connective tissue and fluid that moves between vessels and cells. “Channels,” then could be described as the spaces in the body where this communication occurs. Nigel Wiseman’s Practical Dictionary of Chinese Medicine defines the major channels as having “the function of inter-linking the bowels and the viscera and providing a network of GI and blood by which the whole body is nourished.” So the channels are not structures like the organs of the body that are physically connected to make up the digestive system. They are spaces between muscles, organs and vessels that provide a method of communication and connection. I don’t think that I can describe this network better than Wang Ju-Yi and Jason D. Robertson in the book Applied Channel Theory in Chinese Medicine: “A channel is then like a river in that it includes the riverbanks and also the complexity of life within the water itself held by those banks. In the body, the channels are then groupings of connective tissue that bring together the blood vessels, bones, lymphatic vessels, nerves, tissues, and interstitial fluids.” This analogy creates a strong visual of how these channels fit into our understanding of the body, not just as “lines of energy” as some people have translated; but as a functional part of our physiology. © 2018 Pivot Acupuncture & Physical Therapy.